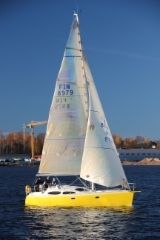 Veleiro Oy is a full-service boatyard located in Kotka, South-East Finland. Our services include winter storage, engine service including water jet propulsion systems and boat repairs. Veleiro is authorized Volvo Penta dealer and Vetus diesel center. We also offer a good selection of second hand marine engines. There's also a very well equipped marine shop at your service. Winter storage is available for motor- and sailboats up to 60 ft (max. 30 ton) and there's a possibility to choose between cold and warm space. Our all-inclusive service covers everything from boat wash to periodic engine service and various repairs during the wintertime and is available on request. Please contact us directly for further inquiries. The workshop serves you even in a distress, we are a licensed glassfibre repair workshop, authorized by insurance companies and our professionals will give your boat the best care available, since 1990. With right tools and skilled personnel with years' of experience in boat building and demand composite repairs, your boat can be as good as new! Our shop is open throughout the year (please ensure opening hours from the left column) and serves you even in most unique needs. The shop keeps common spare parts, Volvo Penta, Vetus and Yanmar parts, accessories, electronics, yachting clothes, boatcare products, lifejackets, ropes, aluminium ribs, tender boats etc. in stock and personal service is always available. 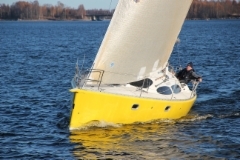 We are the representatives of all the largest marine equipment wholesale companies in Finland (i.e. Maritim, Rymaco, Multimarine, Vestek, Duell, Vetus) and we also import equipment straight from Europe. If the product you need is not in stock it's possible to use our channels and order the products for agreed pickup date.